During the 1814 Peace festivities to celebrate the end of the war with France, a splendid seven-storey pagoda was erected in St James Park. It was perched on a brightly painted Chinese-style bridge spanning the canal. 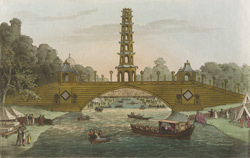 A popular public spectacle, the bridge remained until 1825. The pagoda caught fire during the inaugural fireworks, injuring several workmen in the process.